Camine a pedalear desde la bulliciosa Hoi An hasta los tranquilos canales del delta del río Song Thu en este pintoresco recorrido en bicicleta de 6,5 horas. Cambia la ajetreada vida de la ciudad por un paseo en bicicleta guiado de 9 km (5.5 millas), pedaleando por los pueblos tranquilos y saltando entre las islas en ferry y puentes flotantes. Eche un vistazo a la vida rural mientras se detiene para admirar las artesanías tradicionales, luego disfrute de un delicioso almuerzo casero en una casa de la familia local, antes de regresar a la ciudad. Our guide was amazing, she was informative, friendly and great to be around! The ride was in such a beautiful setting and easy to keep up with for all types fo riders. We stopped a lot along the way to learn about different local plants and stories. It was not pushy at all but a lovely trip to see anoher side of Hoi An you would not get to see on your own. A wonderful half day trip, highly recommend. Great tour with very friendly guides. 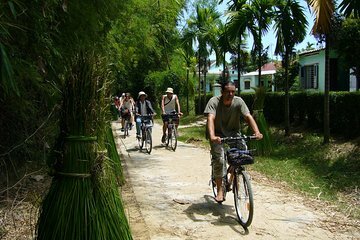 The only thing is that the listed itinerary on your website is wrong...we were supposed to cycle back 1h to Hoi An at the end of the tour, however the guide informed us at the end that we had to leave our bicycles because they were needed for another tour! Therefore we had to go back to Hoi An on a 45min boat journey! that journey was very uncomfortable and this is not what we booked for...what we booked was a bicycle tour! This tour was very enjoyable. It was amazing to see the traditional village life and the customs that are kept alive in these locations. The ride was easy, sticking to flat paths. A highlight was paddling in a basket boat. I would highly recommend this tour to anyone going to Hoi An, as it gives an great perspective of how traditional Vietnamese life was like. Wonderful!!! The tour guides are amazing and informative. We had a great time with our family of five.